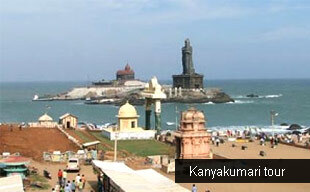 Kanyakumari is the southernmost point of Indian mainland; bestowed with a multifaceted personality. The soil of this scenic beachside territory has different colours, and so is the cultural character of this naturally rich spot of India. On the way to Kanyakumari, tourists can gaze at the mesmerizing sight of farms featuring countless windmills, generating energy and electricity through the sea winds and powering the beach city. This beach is uniquely the meeting point of three seas; the Arabian Sea, the Indian Ocean and the Bay of Bengal. Besides famous as a pilgrim center for Kanyakumari Amman Temple, the beach side city is also known for Vivekananda Rock Memorial, Gandhi Memorial and the recently installed Thiruvalluvar, the respected Tamil poet's larger than life statue towards the opposite side of the beach. Tourists can access the memorial islands through water jetty to experience spiritual peace on ground zero of India, the lowest point in Kanyakumari. Besides this, Kanyakumari's breathtaking beauty even wakes up the lazy spirits. Tourist's, in order to gaze the golden beachside under the saffron hues of sun in the early morning start thronging towards the gushing seashore. And can open up their sleepy eyes to the divine and untouched beauty of the Kanyakumari, the virgin beach. The same sights can be experienced during sunset and moonrise over the waters. Kanyakumari Temple – The virgin goddess, Kanyakumari performed penance on the spot where now the famous Kanyakumari Amman Temple is standing on the seashore, overlooking the the meeting point of three seas. According to legends, Goddess Parvati, in one of her incarnations as virgin girl performed austere penance to marry Lord Shiva. The diamond nose ring worn by the Goddess is also famous for its sparkling splendour and is said to be visible from the sea. Gandhi Memorial – Here at this spot, Mohandas Karamchand Gandhi or Mahatma Gandhi's mortal relics were kept for public view before immersion into the sea. 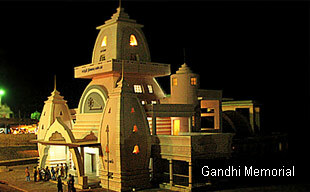 Gandhi Memorial was built later at the site in the form of a Mandapam. The architecture of the building is designed in such a way that allows the rays of the sun to fall on the spot where the ashes were kept. Rock Memorial – Rock Memorial is another glorious shrine dedicated to a spiritual leader, Swami Vivekananda, who through his lectures permeated the pure Vedanta philosophy and spirituality in the west. The memorial stands on one of the two rocks located about 500 meters off the mainland at Kanyakumari. In the month of December 1892, Swami Vivekananda sat on one of the rocks for deep meditation about the past, present and future of India and attained enlightenment. It is believed that here only, the philosopher got an inspiration to attend the Conference of World Religions in Chicago held in 1893. Thiruvalluvar Statue – Adjacent to Rock Memorial and Gandhi Memorial stands a 133 ft highThiruvalluvar Statue. Dedicated to the Tamil saint poet, Thiruvalluvar, who authored Thirukkural, a classic work of couplets. The sight of this immaculately crafted statue is a magical experience throughout the day, especially in the company of rising and setting sun. During nights, the entire Thiruvalluvar complex gets illuminated, towering the skyline of Kanyakumari. 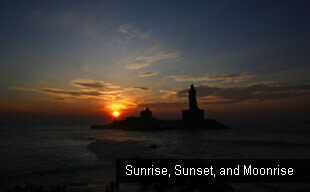 Sunrise, Sunset, and Moonrise – The glory of Kanyakumari is its sunrise, sunset and moonrise. To watch the sun set and to see the moon rising out of the ocean on a full moon day is to savour an experience that lives in one's memory for life. It is the only place in India where one can enjoy the unique spectacle of sunset and moonrise simultaneously on full moon days. It is said that on Chitra Pournami (full moon day in the Tamil month Chitrai) in April, one can see both the sun and the moon facing each other on the same horizon, a rare sight of unique grandeur. Another interesting landscape at Kanyakumari is the beach sands of myriad colours. By Air: The nearest airport is Thiruvanathapuram which is 80 km away. It has both the domestic and international terminals. From Thiruvanathapuram, you can take a taxi or a bus to Kanyakumari. By Rail: Kanyakumari is well connected by rail services with all the major cities in India. Superfast trains connect Kanyakumari with the northern rail junctions and Intercity trains are running from almost all the southern cities. By Road: Kanyakumari has a good road network which connects it to the major cities and towns in South India like Chennai, Bangalore, Madurai, Pondicherry, Thiruvanathapuram and and so on. Tourist taxis and autorickshaws are available for travel in Kanyakumari. Climate – Due to the unique topography of Kanyakumari, the climate is moderately tropical. Thiruvananthapuram – The capital of God's own country, Thiruvananthapuram is a famous excursion of Kanyakumari Tour. Named on the divine serpent of Vishnu, Thiruvananthapuram is the ancient seat of the Travancore rulers bestowed with many tourist and heritage attractions. Padmanabhapuram Palace is one such attraction, featuring the 6 acre royal palace featuring an extensive woodwork. Padmanabhaswami Temple is another great attraction of visiting Thiruvananthapuram. It is the richest temple based on any faith in the world, thanks to the recent discovery of gold worth 100 crores. Madurai – The city dwelled around Meenakshi Temple, Madurai is towered with colourfully sculpted gopuram towers and a thousand pillared hall.